We have a great new tutorial on the blog. Make a fabulous scissor case complete with space for a tape measure, stitch ripper and pins and needles. Makes a perfect gift too. 1cm seam allowances unless otherwise stated. 1. Cut out all the pattern pieces in main fabric, lining fabric, fleece and felt as indicated on pattern pieces. 3. Cut a piece of cord elastic about 9cm in length, fold in half and pin to middle of straight edge of the small pocket piece. 4. Pin pocket lining to pocket across straight edge, right sides together. Stitch across the top making sure elastic is firmly sewn in. 5. 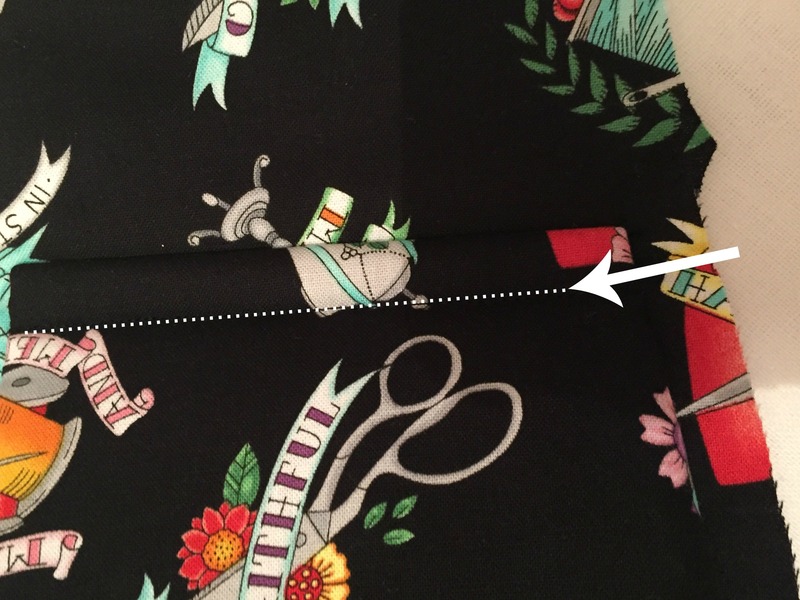 Press seam towards lining and then topstitch. 6. Fold lining onto pocket, wrong sides together and press. 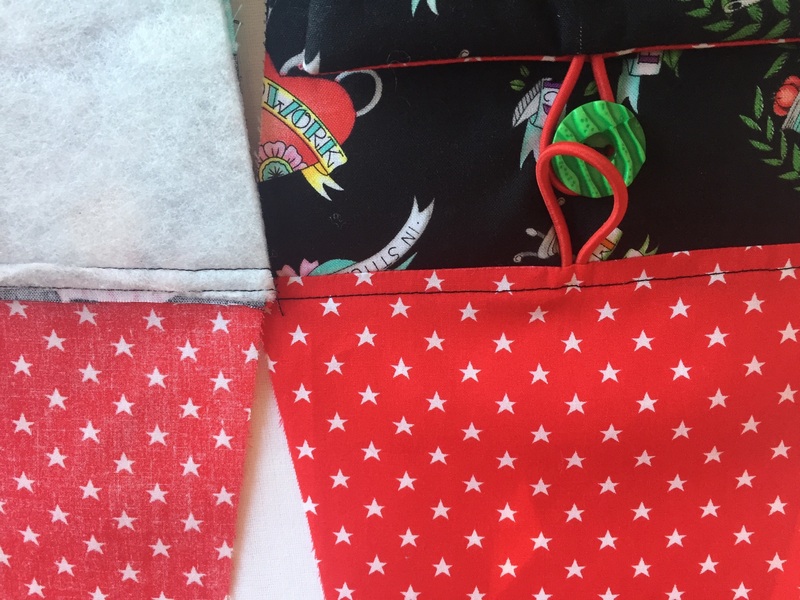 You can sew around the pocket inside the seam allowance or go straight onto step 7 and sew pocket directly to main piece. 8. Cut and attach a piece of cord elastic (as before - instruction 3) to centre of longer edge of flap piece. 9. Pin flap lining to main flap right sides together. Stitch 1cm seam leaving short edge open. Again ensure the elastic is firmly sewn in. 10.Trim corners and turn out and press. 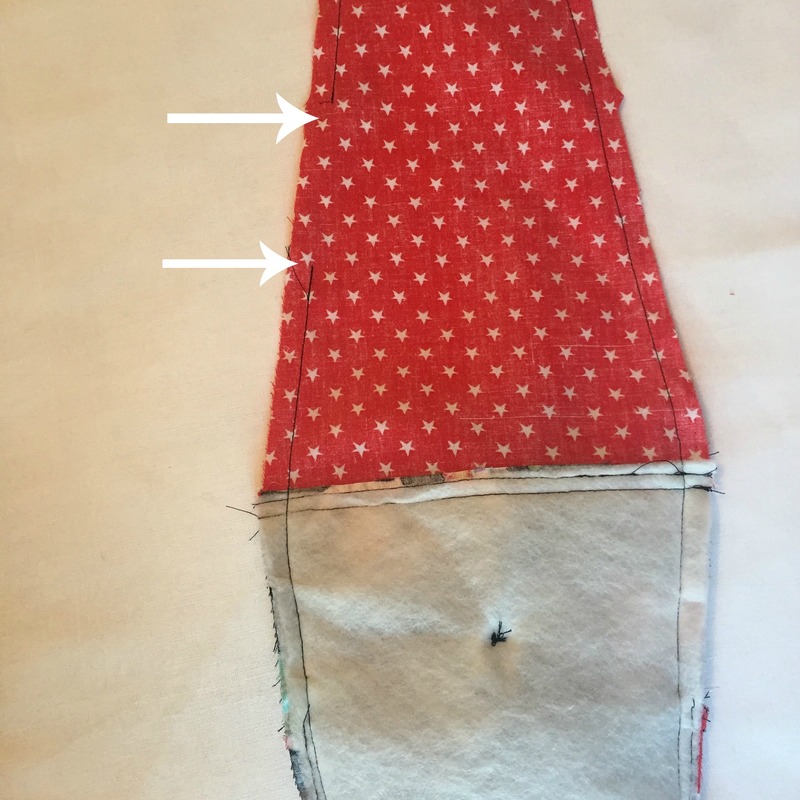 Sew short edges together inside seam allowance (we used a zigzag stitch but straight stitch is fine). 11. Pin to the other main case piece. Place right sides of main fabric together just above the notches. 13. Cut a piece of wide elastic 8cm long and pin end to centre of flap against seam line. Place the felt piece over the top of the elastic making sure it is in the centre and against the seam. Pin in place. Fold flap over enclosing the elastic, felt and raw edge of the flap, top stitch in place 1cm from folded edge. 14.Fold the flap back and pin the free end of the elastic to the main pocket. (note to self - remember to not use black elastic and black fabric!). Sew in place over end of the elastic. 15. 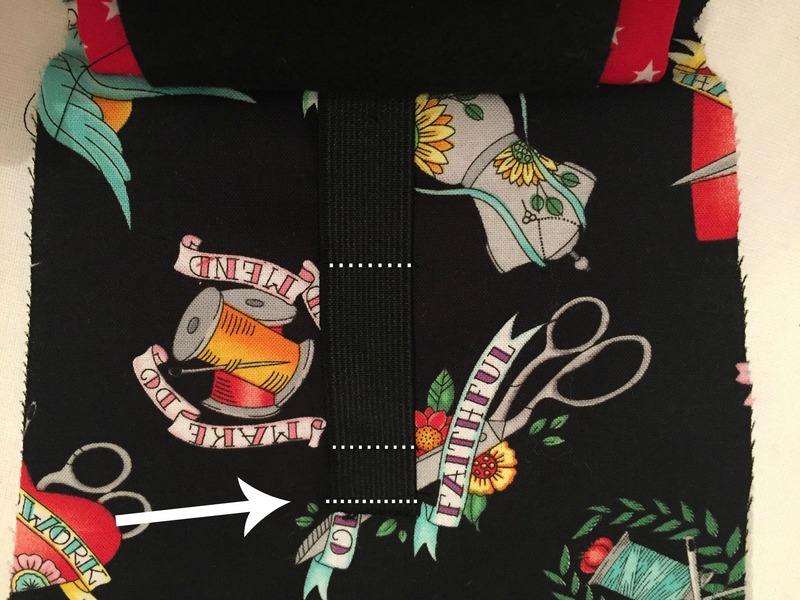 Sew across the elastic with a straight stitch about 1.2cm and 5.5cm from the top edge of elastic to form lops to hold a seam ripper and tape measure. 16. Sew buttons to right side of main pattern pieces under elastic loops. 18. Pin lining pieces to case pieces right sides together along short straight edges. Stitch in place along the top on both pieces. 19.Press seams towards lining and top stitch in place. 20. 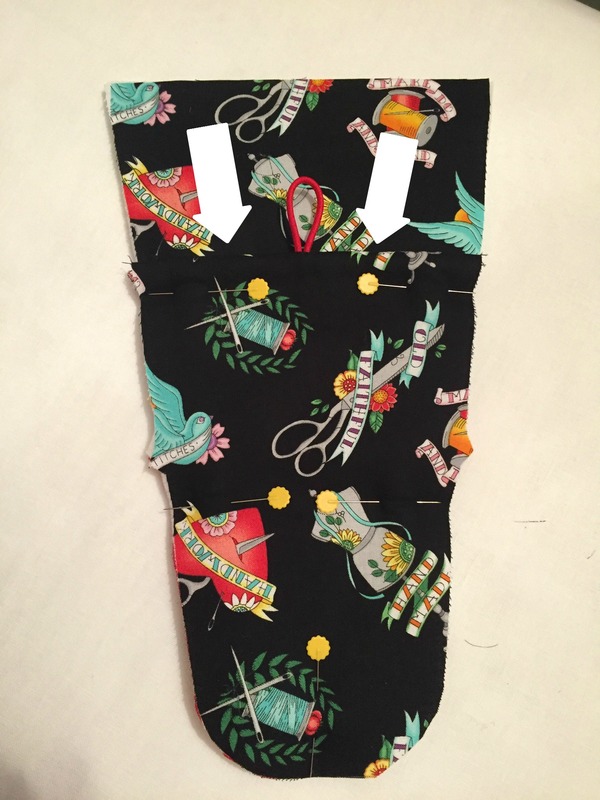 Fold and pin the flap away from the edges so it does not get caught when sewing the front and back case pieces together. 22. Sew around edge leaving a 6cm gap in the side of the lining to turn the case through. 23. Turn case out through the opening. Use a large wooden knitting needle or wooden spoon handle to push the bottom of the case out neatly. Press. 24. Sew the opening in the lining closed and push lining back inside. 25. Add scissors and a stitch ripper and tape measure plus pins and needles to the felt. Sit back and admire your lovely scissor case! We even made a little video to help!